Joseph Cross wears red low cut Converse “Chuck Taylor” All Stars in the film. 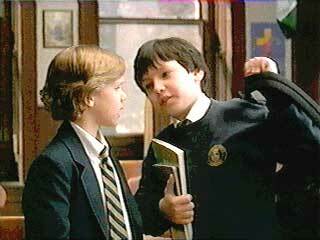 Joshua and Dave are are best friends attending a Catholic school in Wide Awake. 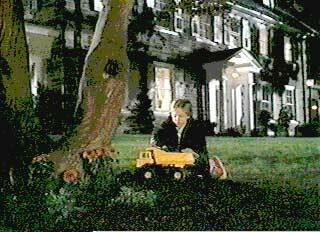 Wide Awake is a film about young Joshua Beal (Joseph Cross), a fifth grader attending an affluent Catholic school in the Philadelphia area. Joshua is in the midst of a spiritual crisis. 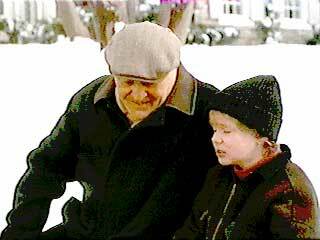 His beloved grandfather (Robert Loggia) has recently passed away from bone marrow cancer, and Joshua has been depressed ever since. Normally bright and energetic, he doesn’t want to get up in the morning, still broods about his grandfather’s room, and is generally worrisome to his mother and father (Dana Delany and Denis Leary). Only his best friend Dave O’Hara (Timothy Reifsnyder) seems capable of keeping Joshua on the ball, and when Dave confronts him about his behavior, Joshua tells him that he is embarking on a spiritual mission. Joshua’s mission is to seek a sign from God that his grandfather is okay in order to validate all of the spiritual beliefs that he has learned in school and heard from devout Catholics like his grandfather. Joshua’s grandfather tells him that he is dying of cancer. Much of the story revolves around how Joshua goes about his spiritual quest. In one of the opening scenes of the film, we see Joshua redirect the conversation in his religion class to ask about whether the unbaptized can actually get into heaven and what the implications of this teaching really mean. Sister Terry (Rosie O’Donnell), the religion teacher, is at first overwhelmed by Joshua’s question and the classes response, but eventually she begins to understand some of the things that he is facing. Joshua’s mission is to somehow have a face-to-face conversation with God, and first he tries to accomplish this through the clergy. He contrives with Dave to escape from the school so that he can talk to the cardinal when he visits the all-girls school next door. When he discovers that the cardinal is just as frail of a human as his grandfather or himself his focus then turns to seeking some physical sign. The storyline also makes use of flashbacks of experiences he had with his grandfather to provide insights about the importance of their relationship. The remainder of the story concentrates on this mission, how Joshua deals with what he finds out, and how his friends and family are affected by Joshua’s ideals and behavior. Joshua decides to bury his grandfather’s shirt in the back yard. Wide Awake is different from most coming of age/spiritual quest type of films because it doesn’t seek to be mainstream in too many ways. First of all, the film is about affluent kids shielded from the “real world” by their private school, their wealth, and social class. Many of the problems that could face average kids in a public school aren’t even a factor here. The diminutive and bright Joshua doesn’t have to worry about bullies in the street making fun of his intellect or picking on him as he is whisked around everywhere by his mom in her expensive car. That said, it is refreshing to see a different and uncynical side to the world of kids. While many critics felt that the film is too contrived in terms of its highly intellectual content, they forget that it still is possible for kids growing up today to have an age of innocence, and that is really what this film is about. We see a fairly realistic side of Catholic school teaching throughout the movie — not just the nuns herding the kids around, enforcing discipline, and being classroom characters, but also how specific and objective their teaching can be, and how they deal with classroom problems, like the kid who always acts crazy to get attention. Writer/director M. Night Shyamalan clearly is giving us an autobiographical look at his own upbringing and some insight into his own spiritual views. Perhaps the dialogue is a little slick for fifth graders but Joseph Cross and Timothy Reifsnyder are capable of making it believeable. If you don’t like young kids making profound statements, Wide Awake is not for you. But if you are willing to accept its premise, then you will be entertained and probably feel good about it. 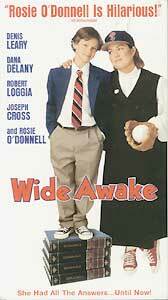 Wide Awake is a little misleading in its cover, which shows Joshua in his school uniform but wearing black chucks, and Rosie O’Donnell in a nun’s habit wearing red low cut chucks. Since most of the film is set in Catholic school, usually you see Joshua in his school uniform without chucks and you never see Sister Terry wearing them. Perhaps the cover was photographed that way to show that both characters were a little off beat. It’s not until nearly the end of the film that you see Joshua wearing red low cut chucks with casual clothes in a couple of scenes. The best scene is when he visits his friend Dave in the hospital. Joshua talks to Dave about his spiritual quest. Wide Awake. (1998) Joseph Cross, Timothy Reifsnyder, Dana Delany, Denis Leary, Robert Loggia, Rosie O’Donnell. Written and directed by M. Night Shyamalan. Categories: Drama, Family.